Can a Water Management System Save You Money on Insurance? What’s the number one insurance claim across America?Water damage. According to the American Insurance Association, nearly 40 percent of homeowners have experienced some sort of property damage or loss due to water. In fact, millions of dollars are spent on water damage insurance claims every year, but here’s the truly surprising fact:about 93 percent of water damage could have been prevented. Water damage is a much more widespread issue than people realize,and what makes it particularly harmful is that it’s often not noticed until it’s too late. Fortunately, homeowners with an understanding of the varying sources of water damage can take steps to protect themselves. One of the simplest and most effective ways to protect your home from water damage is to manage your water. How do you do that?With a water management system! A water management system allows you to conserve and control the water use in your home, but it also helps prevent leaks and water damage.Here’s how it works: Sensors located under each appliance communicate moisture content and flow information to a master control. In the case that an unusually high moisture content or leak is detected, the master control can actually shut off the water flow,preventing leaks and water damage to your home. Investing in a water management system can save you thousands of dollars by preventing costly repairs and property loss, but there are other savings involved,too. Most insurance companies offer homeowners insurance premium discounts if they invest in a water management system. In fact, if you’ve already made a water damage claim in the past, your insurance company may require that you install a water management system to prevent future issues. In the long run, investing in a water management system is a positive for everyone involved. You help protect your home from water damage, your insurance company doesn’t have to pay out on any claims and you get lower insurance premiums. Everybody wins! Don’t wait until you’re faced with severe water damage to your home and a fight with the insurance company. Make the smart decision and protect your home now, before it’s too late. As a master plumber who has dealt with every plumbing issue from leaky pipes to water heater repair in Glenwood Springs,CO, we’ve seen firsthand the havoc that even a little leak can cause. If you’re interested in learning more about the water management systems we install, give Garrett Hansen Plumbing Inc.a call today. 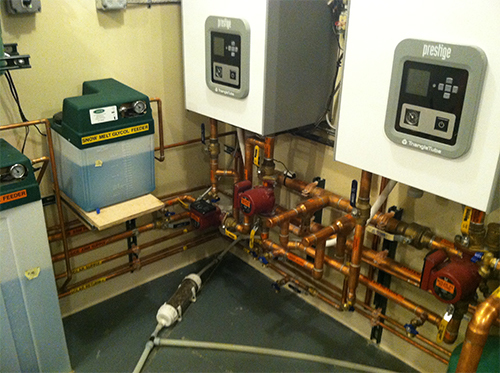 We’ll be happy to walk you through some of the costs and benefits involved with installing a water management system in your home.